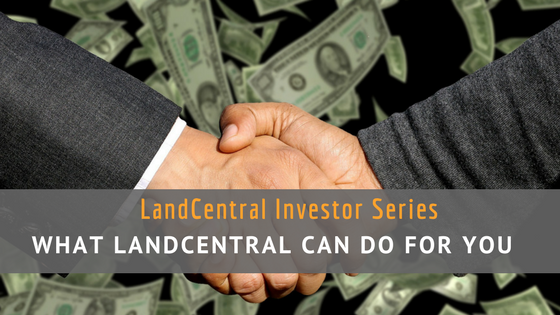 So what can LandCentral do for you? Like you even have to ask. We’re the real deal when it comes to land investing. We have 20 years of experience, experts behind the scenes, and thanks to our innovative mindset, we’ve now bundled properties for your investing convenience. Did you check out our Investor Packs yet? Yes, it’s true. We offer owner financing! No banks, no hassles. No lengthy paperwork requiring a million signatures beneath small print. We don’t even report to credit bureaus, so there are no unnecessary dings to your credit score. It’s that easy. With a small down payment (typical property runs $298.00 after document fee), you can be investing in land tomorrow! Everyone gets the same interest rate of 12.7%. Don’t let this number scare you. Credit cards and bank loans carry much higher interest rates, but unlike them, LandCentral doesn’t have pre-payment penalties if you want to pay your land off early. Like we said, easy. Thanks to our small monthly payments, you’ll have more money to apply it towards what really counts—your investment. We offer a 15 day grace period before any late charges. Why? Because we like you. We also want you to succeed so we’re flexible with your due date. Want to match your payments with your pay cycle? No problem. With LandCentral as your investing partner, the sky really is the limit. Now that we’ve got the financing and payments out of the way, let’s get to the fun stuff. LandCentral gives you instant access to land all over the country. Want to purchase a property in the wild wilderness of Alaska? We’ve got you covered. Looking for a little land in the deserts of Arizona? Yep, we’ve got that too. We even have plots in Hawaii, Colorado and Florida. You name the state and we’ll take you there. We don’t mean to beat a dead horse, but seriously, have you checked out our Investor Packs? Besides being an innovative way to invest in real estate, these packs offer some serious value. They’re tailored to your investing level, consist of property all over the country, and most require little to no maintenance. Oh, and they’re affordable. What more could you ask for? But don’t take our word for it, check out our Investor Packs for yourself. Next up is our Top 10 Resources for Investors. In case you missed it, Your Financial Freedom is Calling. Invest Now!